Please come to the UCSC Art Department’s 2018 Graduation Celebration Friday June 8th at 3pm in the Art Department Courtyard. 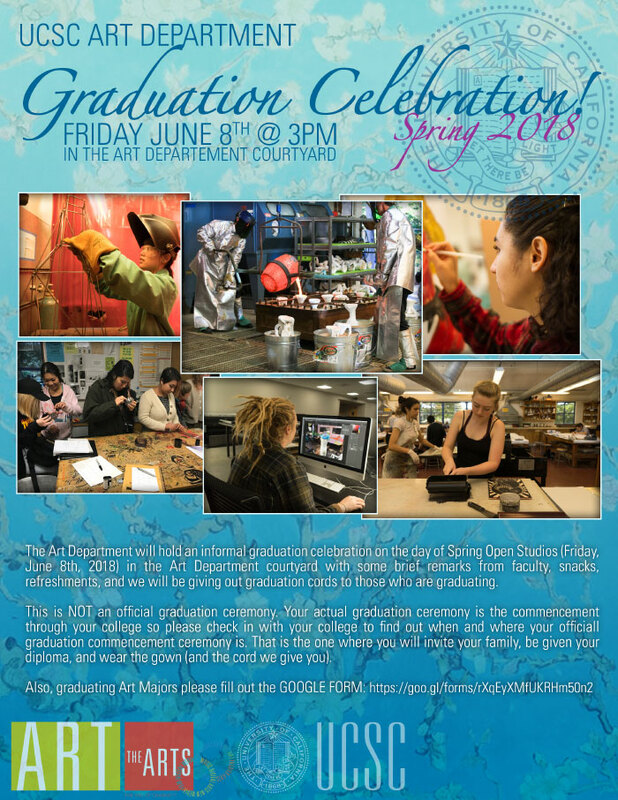 The Art Department will hold an informal graduation celebration on the day of Spring Open Studios (Friday, June 8th, 2018) in the Art Department courtyard with some brief remarks from faculty, snacks, refreshments, and we will be giving out graduation cords to those who are graduating. This is NOT an official graduation ceremony. Your actual graduation ceremony is the commencement through your college so please check in with your college to find out when and where your official graduation commencement ceremony is. That is the one where you will invite your family, be given your diploma, and wear the gown (and the cord we give you).